Get into juicing with this no-nonsense dual-speed juice fountain cold. Ideal for first-time juicers, this juicer runs on 850 watts and has two speeds, 13,000RPM or 6,500RPM, for hard and soft ingredients. Fruit is largely composed of water, but its selling point is its nutritional value. How do you extract the juice from fruit, without leaving the nutrients behind? Breville’s Nutria Disc and patented juicing system extract more nutrients than other juicers and transfers less than 1.8F of heat to protect enzymes and maximize nutrient absorption of select nutrients. 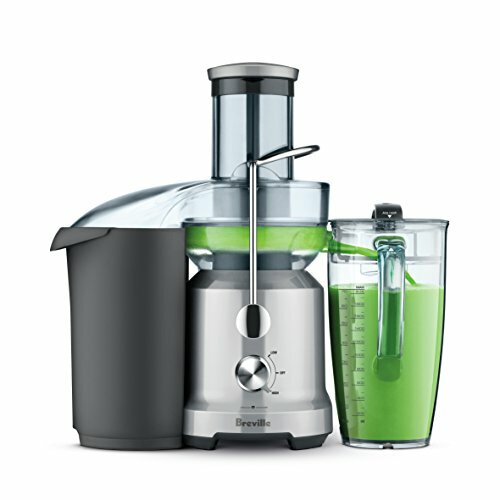 The uniquely designed juicing system features a feed chute that is centered over the shredding disc. This allows for more efficient juicing than systems that introduce ingredients on the side of the shredding disc. The dual speed, 850 watt motor allows you to juice hard fruits and vegetables like apples and beets on high speed at 13,000 RPM, while the low speed (6,500rpm) is optimal for softer fruits and leafy green vegetables like cantaloupe and spinach. The Juice Fountain Plus cutting disc is so powerful that pineapple can be juiced in large chunks with the rind on. In addition, this juicer features an extra-wide 3-inch feeder chute that accommodates large chunks or entire pieces of fruit or vegetables, eliminating the need for chopping vegetables. The BJE430SIL is not only easy to use, but also easy to clean. It is pulp-ejecting and comes with a large-capacity pulp collector and most parts can be cleaned on the top shelf of the dishwasher.